The golf team finished its season 8-8. 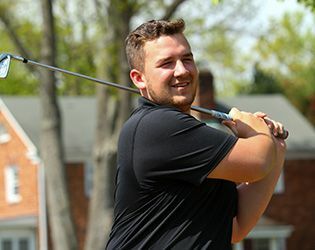 Throughout April, senior captain Dylan Blackman posted the low score in seven matches, including two scores in the 30s, before an injury sidelined him for the rest of the season. Without Blackman, the team looked to Troy Pilla '17, who frequently posted low scores and consistently shot in the low to mid 40s, to lead the charge. April highlights included a two-stroke win over Princeton Day School, a decisive 173-218 win over Belvidere High, as well as wins over South Hunterdon, Rutgers Prep and Delaware Valley. The team finished out the month with a win over Belvidere in which the Knights posted the top six low scores. May brought a mix of wins and losses, with notable victories over South Hunterdon and Rutgers Prep. Looking ahead to next spring, the team will miss the talented Blackman as well as the contributions of recent graduates Charlie Kasman, who consistency posted scores in the 40s, Tyler Kwaak, Nic Ricciardi and Sam Zimmer. Boding well for next season, six rising seniors will return to the program. Among them, Pilla will be expected to play a significant role. In addition, the team will continue to rely on solid play from Tristan Kaminski, Graham Valentine and Grayson Valentine, all of whom consistently shot in the 40s and low 50s, and on increased contributions from Lila Birnberg and Christian St. Germaine. Rising junior Bailey Gano will be expected to play a larger role next season, as will rising sophomore Abhay Puri.